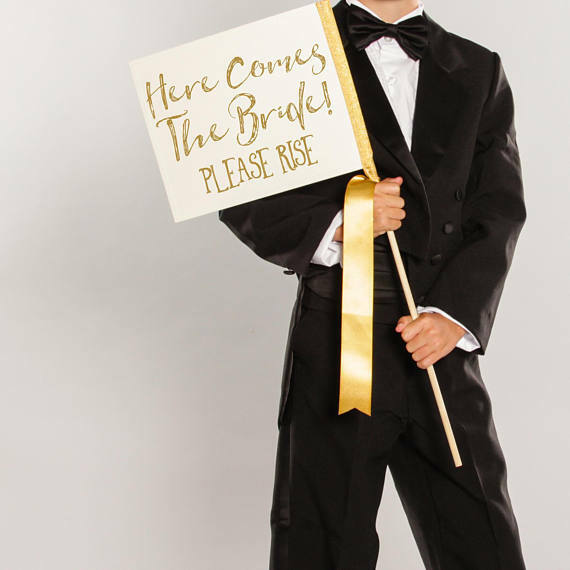 Put this here comes the bride sign on your list of must-haves for your ceremony! 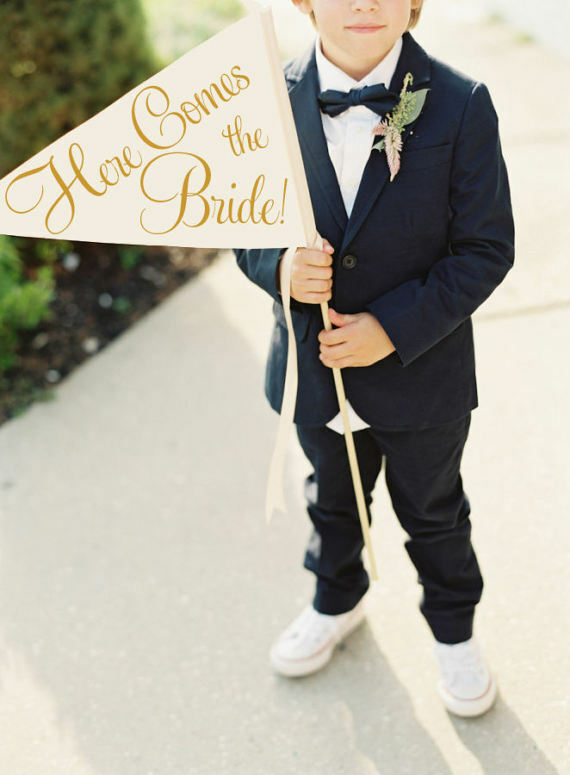 Today we’re talking about the ring bearer sign, a fun and creative alternative to the ring pillow (or flower basket). Take a look! We’ve always looking for the latest alternatives to traditional wedding ideas. 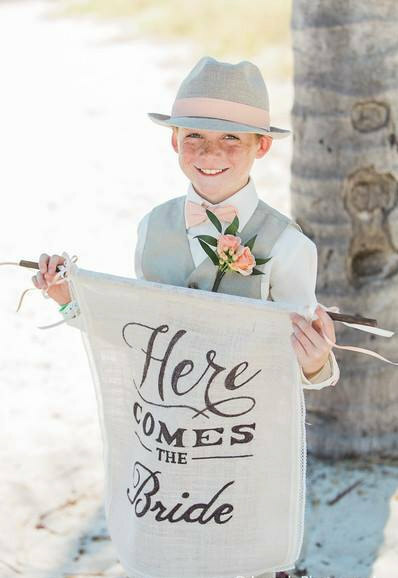 Ring pillows are still popular today, but the ring bearer sign is making its way down the aisle for weddings across the globe! 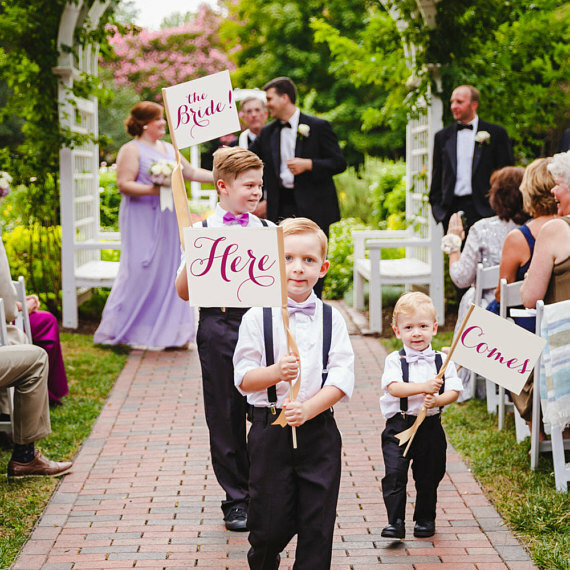 You’ve heard of the ring bearer block and box; today it’s all about the ring bearer sign! 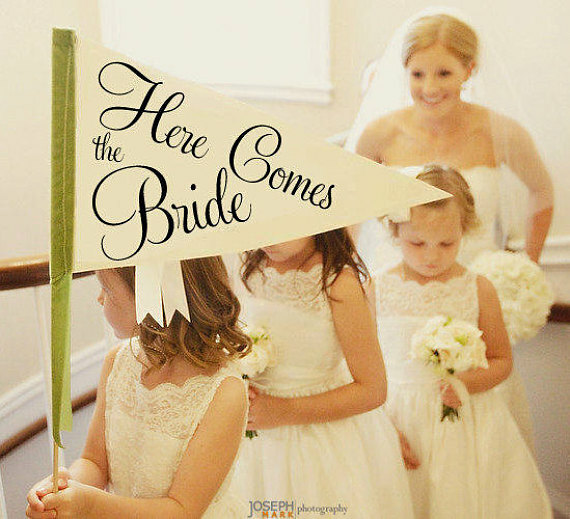 This sign, usually featuring the words “Here Comes the Bride”, is topping the trend charts. I wish I knew of these signs when I got married; they’re so cute! 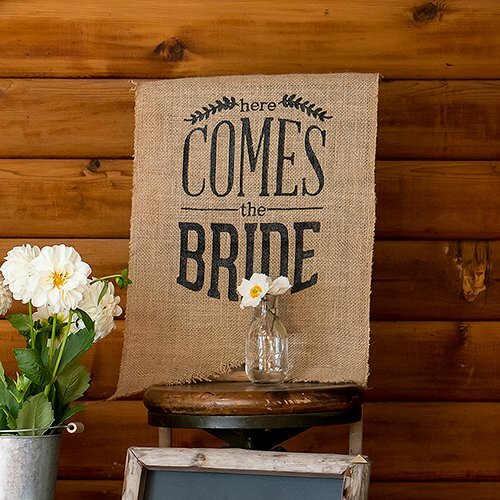 This popular here comes the brides sign is typically made of cardstock, lightweight canvas, wood, burlap, and linen, each with a pair of ribbons to hold or dowels to carry. These materials are ideal for a sign like this, as they’re lightweight enough for little hands to carry. Many even find a sign easier to carry than a ring pillow, since there is no worry of a lost ring or needing to use two hands steadily underneath it (which can be tough for smaller attendants). 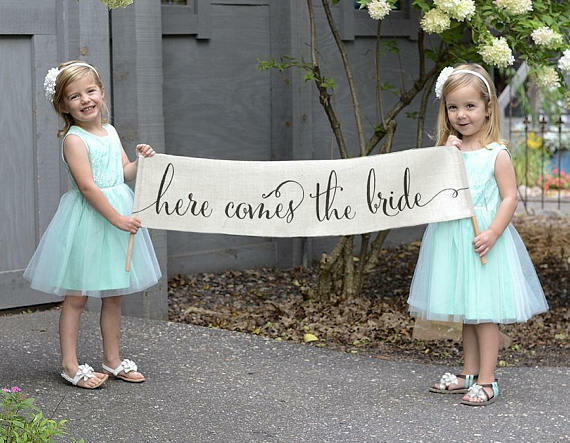 Here are some here comes the bride sign ideas you’ll love! Up first, take a peek at these banners from The Ritzy Rose. 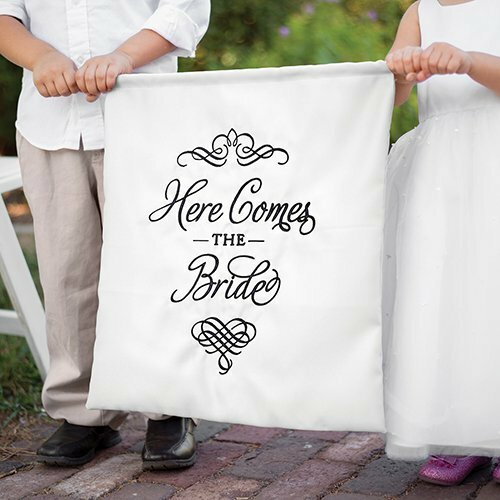 This particular here comes the bride sign is one of their best sellers and is designed as a flag. It is handmade with paper cardstock and is placed on a lightweight dowel for easy carrying down the aisle. There are many color options available. Here are a few additional here comes the bride pennants and flags we spotted in their shop. Want a fun and modern font? We love this pennant flag available in their shop, new this season. This here comes the bride sign can also tell guests to stand for the bride’s arrival. Good idea! Have a trio of ring bearers? 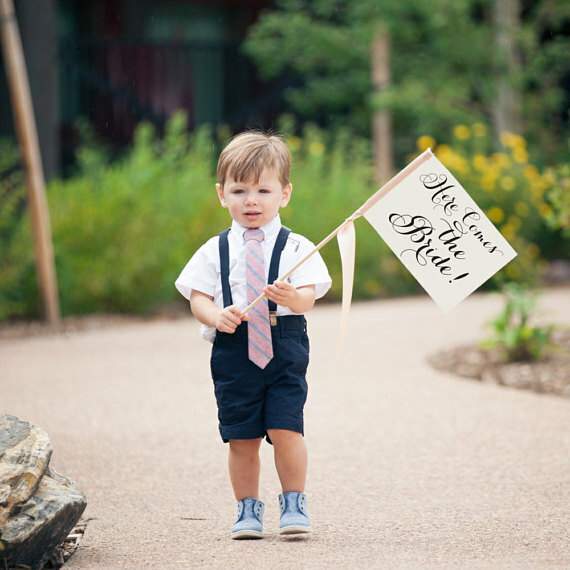 Give them this three-part sign to announce the bride’s arrival. This next sign is made of canvas. It can be worn as a necklace or held/carried by a rind bearer, flower girl, or attendant as they usher you down the aisle. This charming unbleached cotton muslin fabric is handmade with love by The Craft and Cupboard. Choose your wedding colors for the font to tie in beautifully with your theme. 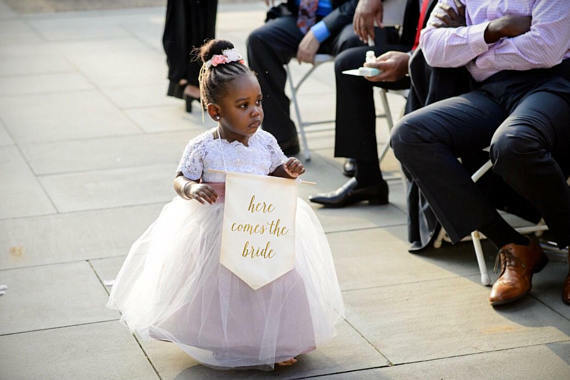 p align=”justify”>This flower girl sign and basket makes a clever combination! 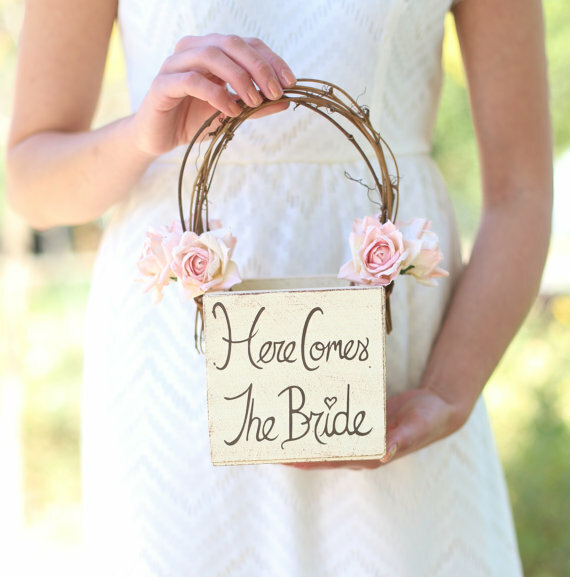 This wooden basket features the words “here comes the bride” onto the front so it can be used as a flower girl basket and a cute sign in one. The flower girl can hold petals for tossing, if you’d like, while announcing your arrival. Cute idea! Handmade by Bragging Bags. 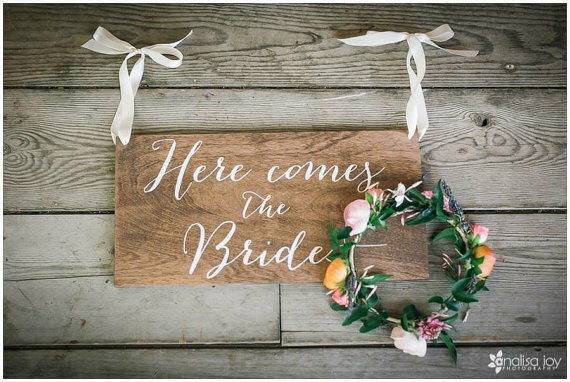 p align=”justify”>This rustic here comes the bride sign is made of wood and features delightful hand-lettering by Paper and Pine Co. 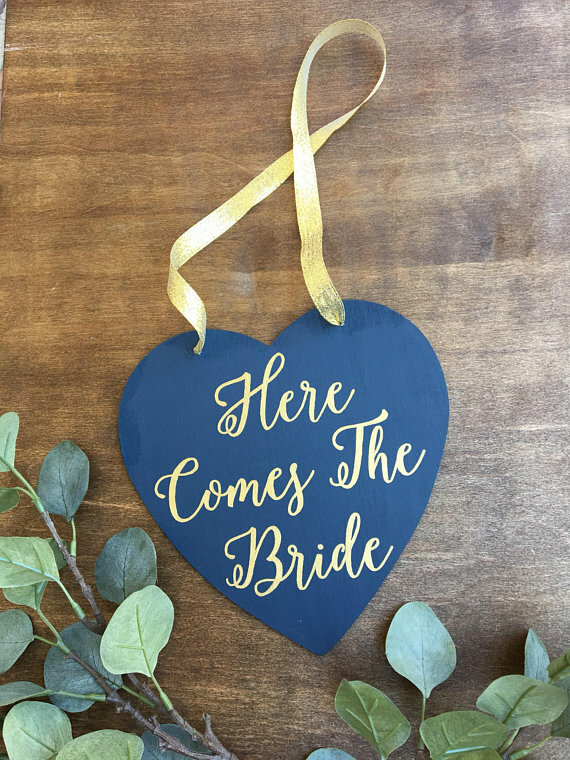 This here comes the bride sign is also made of wood, but features a unique heart-shaped design. I also love the bold painted color on the wood, which can be painted any color you’d like to coordinate with your wedding colors. By Just For Keeps. 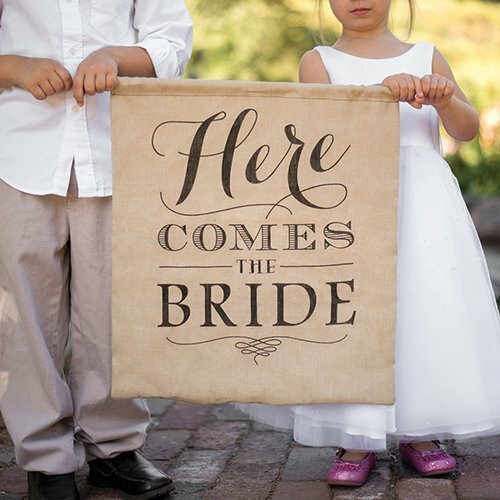 This burlap sign will announce your arrival in style and features natural edges and a fun modern font print. Choose black or gray font. By BeauCoup. This burlap sign is another cute option, made of shimmery hessian fabric. Looks lovely! By Roots and Lace Design Co. 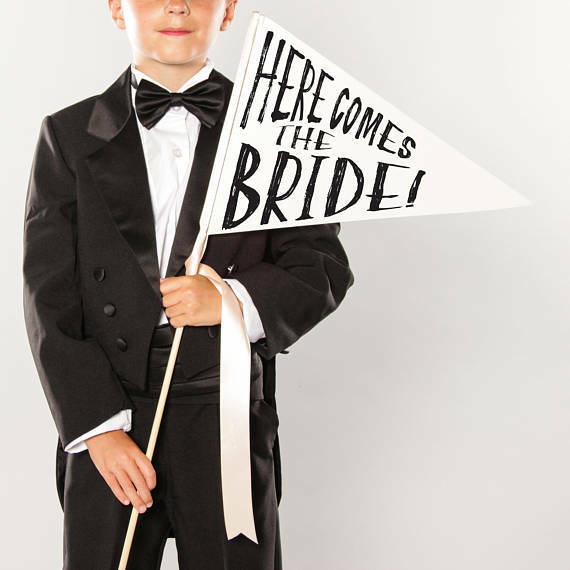 This here comes the bride banner is perfect for two attendants to hold, with one dowel on each end. By Jazzy Apple Gal. This sign is available in white linen or natural burlap. The sign is easy to hold, set on a lightweight dowel, and can be held by two attendants. Via here. Here’s the sign in burlap!